Personal Training - it's 2019 so get in shape now! Specializing in a non-invasive "no wear and tear" positive stress exercise system that stresses the physiology of the body in a stimulating yet safe non-invasive way, and we assist the body in responding to that positive stress (of adapting and making its tissues stronger) by providing the body complete total nutrition with all the essential nutrients it needs, learning what to avoid and why, plus proper rest and sleep. Perfect for Senior Citizens. Need to lose weight but not your health? Would you like to have steady energy and not feel tired? Would you like a thinner waist? Are you looking for a complete step by step system designed by a Personal Trainer? Do you want results that include safe effective non-invasive exercise? Do you want a system that as you work it, it works for you? Would you like to get healthier as you lose weight? My Personal Training wisdom contained in this realistic system can help you achieve lasting quality results using the synergy of the four quadrants of fitness. "The Fitness Quadrant" - my fitness and weight loss system, gives you the plan to increase health as you boost metabolism and lose body fat as you move through each day using the synergy of fitness - all detailed in the "class textbook" that I designed and personally use in my actual Personal Training sessions. In my 308 page paperback (or E-Book): The Fitness Quadrant, my complete system that I teach and train my personal clients with, is yours to follow step by step as it completely explains the simple and balanced synergy of fitness. Synergy is your key to fitness and safe lasting weight loss by finding your balance between eating, rest & exercise. Understanding how to balance and implement synergy is what can make all the difference in your success! 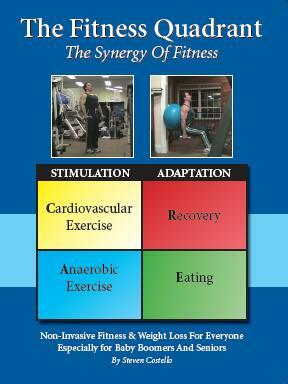 Balanced synergy is contained in the four parts of the Fitness Quadrant: Cardio, Anaerobics, Eating and Recovery. C A R E.
Get the results you want by using balanced synergy explained in the state of the art manual for fitness and weight loss - The Fitness Quadrant provides you the ultimate customized system for fitness success. Save yourself valuable time in learning the synergy of the fitness and weight loss system quickly by "taking the author and trainer home with you" as you follow the program and concepts in the book. by doing the correct amount of the "right" exercises and activities! The Fitness Quadrant program explains the simple and balanced synergy for fitness that is contained in the four parts of the quadrant – Cardio, Anaerobics, Eating and Recovery. C A R E. Using the unique system of “Choose Your Path”, you choose to follow either a very simple plan, or a very detailed calculated plan. So, depending upon your personality, patience and fitness level, this system and book is for you! Many of us want to have healthy and lasting weight loss - That means ONLY losing the body fat and adding lean muscle because muscle is where the fat is burned (and for many of you getting BACK the lean muscle you had when you were young and in good shape). Looking for the best Personal Training in the New Jersey Shore area? Completely The Best Training At The Best Lowest Prices! By being a Fitness Quadrant client you get the full benefit of Coaching and Consulting for your complete program of all the four quadrants - not just during your Personal Training exersise session! To be successful we must be eating, resting and exercising correctly, and since about 97% of our time is spent in the R and E Quadrants, you will get the support you need as your entire plan is reviewed and modified during your session and also in between sessions (during these important times spent in your C, R and E Quadrants) by calling or emailing and getting your questions answered. Personal Training sessions may be currently available with Steve personally. Openings that may be available have specific time frames, so write or call for scheduling and possible availability, a waiting list may be in effect if there are no current openings, so reserve your spot on the waiting list. Alert - Are You Sweating Out All Your Nutrients? Need More R & R? None of the information on this website is intended to diagnose, treat, cure or prevent any disease or to take the place of your physician. All that is recomended on this site is to support and promote your health. The statements regarding these products have not been evaluated by the Food and Drug Administration. These products are not intended to diagnose, treat, cure or prevent any disease. The information on this Web site or in emails is designed for educational purposes only. It is not intended to be a substitute for informed medical advice or care. You should not use this information to diagnose or treat any health problems or illnesses without consulting your pediatrician or family doctor.